Another year of Amy Seiwert’s Imagery’s SKETCH series; another chance to marvel at where contemporary ballet is in 2015. As the ever-elegant Artistic Director Amy Seiwert made some introductory remarks, she explained that SKETCH was designed to challenge both choreographers and dancers to go outside their comfort zone. To that end, 2015’s program, subtitled Stirred, joined three works: 2012’s Traveling Alone, Seiwert’s new piece Back To along with Starting Over at the End. This last work was really the centerpiece of SKETCH 5, a collaborative project between Seiwert and ODC Co-Artistic Director KT Nelson. Prior to the showing of Starting Over at the End, Seiwert and Nelson also spoke a bit about the process that went into the making of this particular dance, because as they shared, it is challenging to capture and communicate choreographic process on stage and in real time. But the results speak volumes. Starting Over at the End was narrative revealing and structural edgy; I can only imagine how live and charged the studio incubator must have been during the compositional journey. 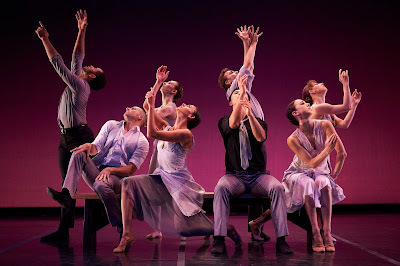 An ensemble work, Traveling Alone, was originally created by Seiwert in 2012 and premiered by the Colorado Ballet. A soloist (Dana Benton) began a sculpting variation in a corridor of light stage left, arms darting through and dividing the space while spinning in a series of turns. Then, a contemporary corps de ballet (four couples dressed in white) joined the action and began a pas de deux – sometimes in unison, sometimes in sets, sometimes on their own. Once each group (the soloist and the corps) had been introduced, they began working together and taking on each other’s movement quality. Traveling Alone was certainly not devoid of emotion, but the piece appeared to be non-narrative, or at least non-linear. Instead, structure, formation, vocabulary and organization were constantly in flux and at play. And brilliantly so. The flow between each different system was seamless, making Traveling Alone a physical stream of consciousness. One of my favorite moments in the ballet was the pas de trois about a third of the way through. The pas de trois is a common configuration in both traditional and contemporary ballet, but it is also one of the most difficult to choreograph and execute. This one delivered on both fronts. If there was one criticism of the work, it was the womens’ costumes. New design and new ideas are integral to dance today, but these skirts didn’t work. Nelson and Seiwert’s collaborative endeavor, Starting Over at the End, took the middle spot on the program. A set of different dance pieces that fit together to form a gorgeous and complete puzzle, the individual sections were overlaid like Baroque music (even though the Schubert score represents the space between the Classical and Romantic eras, which was quite a bit later). Within the rich choreographic material, several moments deserve special mention. The first solo had an elegant grace that was constantly interrupted with surprising and unexpected changes in direction and dynamics. A pas de deux for two men was powerfully electric from the first instant to the last. In one of the final duets, Liang Fu lowered Annali Rose slowly onto the floor. Watching her wrists unfold gently was truly magical. But the standout solo was for and by James Gilmer. He began stationary in parallel fourth while his arms and upper body had their own chance to shine. Quickly, his whole being engaged with vast extensions and expansive positions. Starting Over at the End also had some strong narrative moments, particularly when a solo was happening amidst much action on the stage. These several instances relayed a palpable, real sense of being surrounded by others, yet still feeling left out, ignored and forgotten about. Though not at all the same piece (choreographically nor structurally), Back To had a similar nostalgia as Sophie Maslow’s 1941 masterwork, Dust Bowl Ballads. At its heart, Back To is about community, but not just the overall notion of community, the actual community that has been created by these dancers. This was apparent right from the start as the company came out walking clustered together. Each of the subsequent dance vignettes was set to Bluegrass music by Gillian Welch and David Rawlings – there was a wedding quintet, a passionate, romantic duet full of abandon (again by Rose and Fu), a funeral scene and a dance about salvation. Each part was a delight, and I also liked how instead of closing with a big ensemble phrase, Back To concluded quietly. As the others had left the stage, Rose sat on the bench that had figured predominantly throughout the work, which again had us pondering community. At the very end, there was a feeling of alone-ness, but not sadness. Was that because the community had been so strong and so present that she could sense it and remember it even when she was by herself?